Crucible Liners for e-Guns and many other Electron Beam Evaporation Sources. 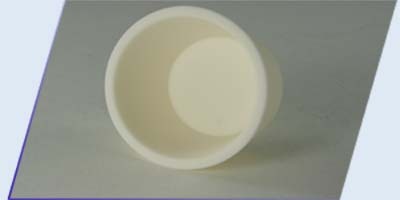 International Ceramic Engineering manufactures varying sizes of crucible liners as part of our standard product line. Our crucible liners provide superior yields, enhanced performance, high thermal stability, greater evaporation rates, lower power requirements, reduced crucible damage, and less down time. You will achieve greater evaporation rates at the same power level and the same evaporation rates at a lower power level due to the thermal isolation between the evaporant material and the water-cooled crucible. The liners are made from exotic ceramic materials, high purity 99.5% Alumina and Boron Nitride. Please see our Material Data page for material property data sheets.